Perhaps the most exciting time of a young dancer's life, especially one studying ballet, is to be cast in a production of The Nutcracker. Even more special, would be chosen for the part of Clara. 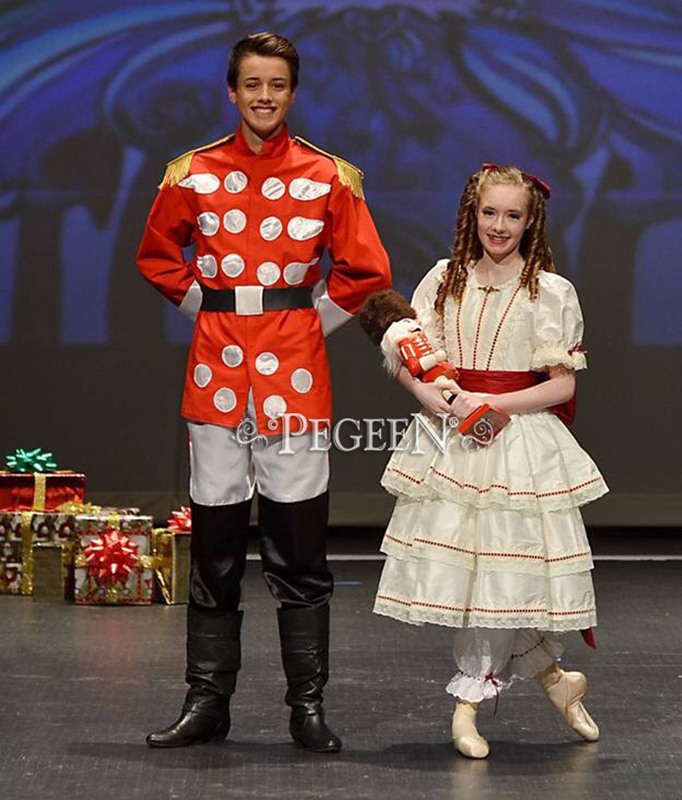 So, when our customer's daughter was cast for the part, the mom came to us for a custom Nutcracker costume for her daughter to wear during the ballet. This dress was based on style 756 and had the base color in Bisque and the sash in Cranberry silk with cranberry ribbon lace trim.This dress is part of the Nutcracker Collection for the Clara Party Scene Dresses. Nutcracker Clara Dress Style 756 CLARA RIBBON RUFFLE DRESS Made in shorter knee length so you can dance but longer length is optional. Three tiers, trimmed with ribbon and , Large Puff Sleeves. Side sashes. The sash is sewn into the skirt. Available from 6 through Plus Sizes or Women's Sizes, attached crinoline/petticoat and lined with silk. Mother of Pearl back button. Optional Pantaloons for an additional $50. Order a matching American Doll Outfit for just $60.